Britta Ambauen’s tactile necklace features three movable leaves symbolizing new beginnings. While trees are associated with stillness (you know the yoga pose), their leaves get to have a little fun. Britta Ambauen captures the beauty of wavering foliage in this tactile necklace. Leaves sway in the wind, change with the seasons, and even let go of their branches. By incorporating them as symbols of change in her design, Britta created a piece that celebrates embracing the unknown and trying new things. 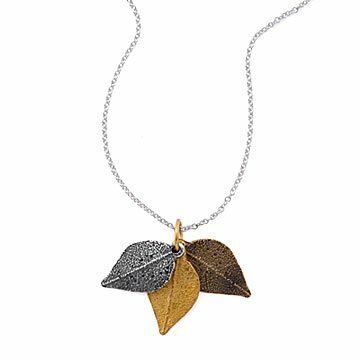 Made of bronze and silver, each leaf is movable, ready to be flipped over the necklace's ring when you feel like fidgeting. The sterling silver chain is intentionally long (32 inches), to keep the charms easily within reach. Give one to someone who's about to start their next adventure, or wear it to symbolize turning over your own new leaf. Handmade in Seattle, Washington.